In the tradition of Jon Krakauer's Into Thin Air and Sebastian Junger's The Perfect Storm comes a true tale of riveting adventure in which two weekend scuba divers risk everything to solve a great historical mystery--and make history themselves.For John Chatterton and Richie Kohler, deep wreck diving was more than a sport. Testing themselves against treacherous currents, braving depths that induced hallucinatory effects, navigating through wreckage as perilous as a minefield, they pushed themselves to their limits and beyond, brushing against death more than once in the rusting hulks of sunken ships.But in the fall of 1991, not even these courageous divers were prepared for what they found 230 feet below the surface, in the frigid Atlantic waters sixty miles off the coast of New Jersey: a World War II German U-boat, its ruined interior a macabre wasteland of twisted metal, tangled wires, and human bones--all buried under decades of accumulated sediment.No identifying marks were visible on the submarine or the few artifacts brought to the surface. No historian, expert, or government had a clue as to which U-boat the men had found. In fact, the official records all agreed that there simply could not be a sunken U-boat and crew at that location.Over the next six years, an elite team of divers embarked on a quest to solve the mystery. Some of them would not live to see its end. Chatterton and Kohler, at first bitter rivals, would be drawn into a friendship that deepened to an almost mystical sense of brotherhood with each other and with the drowned U-boat sailors--former enemies of their country. 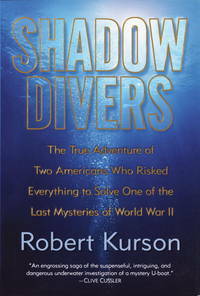 As the men's marriages frayed under the pressure of a shared obsession, their dives grew more daring, and each realized that he was hunting more than the identities of a lost U-boat and its nameless crew.Author Robert Kurson's account of this quest is at once thrilling and emotionally complex, and it is written with a vivid sense of what divers actually experience when they meet the dangers of the ocean's underworld. The story of Shadow Divers often seems too amazing to be true, but it all happened, two hundred thirty feet down, in the deep blue sea.From the Hardcover edition. Random House. Hardcover. 0375508589 Item in very good condition! Textbooks may not include supplemental items i.e. CDs, access codes etc... . Very Good. Random House. Used - Good. All orders guaranteed and ship within 24 hours. Your purchase supports More Than Words, a nonprofit job training program for youth, empowering youth to take charge of their lives by taking charge of a business. Random House Publishing Group, 2004. Hardcover. Acceptable. Disclaimer:A readable copy. All pages are intact, and the cover is intact. Pages can include considerable notes-in pen or highlighter-but the notes cannot obscure the text. The dust jacket is missing. At ThriftBooks, our motto is: Read More, Spend Less. Random House Publishing Group, 2004. Hardcover. Acceptable. Disclaimer:A readable copy. All pages are intact, and the cover is intact. Pages can include considerable notes-in pen or highlighter-but the notes cannot obscure the text. At ThriftBooks, our motto is: Read More, Spend Less.Dust jacket quality is not guaranteed. Random House Publishing Group, 2004. Hardcover. Very Good. Disclaimer:A copy that has been read, but remains in excellent condition. Pages are intact and are not marred by notes or highlighting, but may contain a neat previous owner name. The spine remains undamaged. At ThriftBooks, our motto is: Read More, Spend Less.Dust jacket quality is not guaranteed. Random House Publishing Group, 2004. Hardcover. Good. Disclaimer:A copy that has been read, but remains in clean condition. All pages are intact, and the cover is intact. The spine may show signs of wear. Pages can include limited notes and highlighting, and the copy can include previous owner inscriptions. At ThriftBooks, our motto is: Read More, Spend Less.Dust jacket quality is not guaranteed. Random House Publishing Group, 2004. Hardcover. Good. Disclaimer:A copy that has been read, but remains in clean condition. All pages are intact, and the cover is intact. The spine may show signs of wear. Pages can include limited notes and highlighting, and the copy can include previous owner inscriptions. The dust jacket is missing. At ThriftBooks, our motto is: Read More, Spend Less. Random House Publishing Group, 2004. Hardcover. Acceptable. Disclaimer:A readable copy. All pages are intact, and the cover is intact. Pages can include considerable notes-in pen or highlighter-but the notes cannot obscure the text. An ex-library book and may have standard library stamps and/or stickers. At ThriftBooks, our motto is: Read More, Spend Less.Dust jacket quality is not guaranteed. Random House Publishing Group, 2004. Hardcover. Good. Disclaimer:A copy that has been read, but remains in clean condition. All pages are intact, and the cover is intact. The spine may show signs of wear. Pages can include limited notes and highlighting, and the copy can include previous owner inscriptions. An ex-library book and may have standard library stamps and/or stickers. At ThriftBooks, our motto is: Read More, Spend Less.Dust jacket quality is not guaranteed. Random House. Hardcover. 0375508589 . . Fine. 2004. Random House. Used - Very Good. Great condition for a used book! Minimal wear. Random House. Used - Very Good. Ships from Reno, NV. Former Library book. Great condition for a used book! Minimal wear. 100% Money Back Guarantee. Shipped to over one million happy customers. Your purchase benefits world literacy! Random House. Used - Acceptable. Random House, 06/29/2004, Hardcover, Acceptable condition. Good dust jacket. Dampstained. Hard Cover. Random House 2004. The true adventure of two americans who risked everything to solve one of the last mysteries of World War II. Unless Listed in this decription, VG or Better. Random House. Used - Very Good. Very Good condition. Good dust jacket. Short gifter's inscription on endpage.